Six men have been jailed after scamming Lincolnshire pensioners out of thousands of pounds. The scam saw gang members ruthlessly deceive older and vulnerable people on their own doorsteps, pressurising them into paying extortionate prices for shoddy and unnecessary building work on their properties. · Tyrone St John Beard, 46, of Marnham Road, Tuxford, Nottinghamshire, received six and a half years imprisonment. 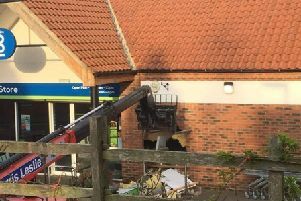 · Marcus Reading, 27, of Marnham Road, Tuxford, Nottinghamshire, received four and a half years imprisonment. · Simon Davies, 24, of Ash Vale, Tuxford, Nottinghamshire, received 18 months imprisonment. · Michael Sean Sumner, 28, of Peel Avenue, Tuxford, Nottinghamshire, received 18 months imprisonment. · Christopher Russell, 28, of Rowan Drive, Kirkby-in-Ashfield, Nottinghamshire, received 18 months imprisonment. · Mohammed Zulbair Ditta, 42, of Hawes Road, Bradford, West Yorkshire, received three years imprisonment. She said: “When we started receiving these complaints, the size and scale of the investigation quickly became apparent. It was quite clear that this was a huge project and as such, we referred it to the Trading Standards East Midlands “Scambusters” Team. “The team then lead a two year investigation into this group of conmen. They had been targeting hundreds of elderly, frail or vulnerable people to agree to improvements to their driveway or roof coatings. Complaints were received from across Lincolnshire, Nottinghamshire, Yorkshire and Cambridgeshire. A victim, who does not wish to be identified, used the company to clean her roof and add a protective seal to prevent moss growth. She was shown a video before the work was carried out that indicated plastic sheeting would be used to protect her garden whilst the pressure cleaning took place. · Get at least three written quotes to compare. · Use reputable companies that have been recommended by friends or family, are part of an approved trader scheme, or where you’ve seen examples of their work first-hand. · Keep in control and don’t feel pressured. If in doubt, just say “no”.